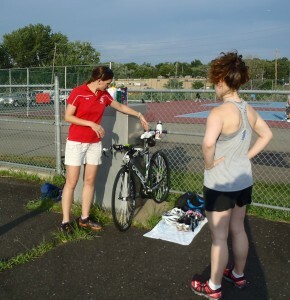 At Rise Endurance, we specialize in Run Coaching and Triathlon Coaching for long course athletes. Coach Joan holds an advanced degree in Exercise Physiology from Columbia University, an Ivy League research university in New York City. She also holds the industry-leading Certified Strength & Conditioning Specialist (CSCS) certification from the National Strength & Conditioning Association (NSCA), the worldwide authority on strength and conditioning. We develop exercise prescriptions tailored to your needs and requirements in order for you to meet your running and triathlon goals. Having a coach who’s an Exercise Physiologist means that you have a health professional on your side who’s qualified to conduct and evaluate fitness and exercise assessments. Someone who has studied the body’s responses and adaptations to exercise and can apply her knowledge to improve your athletic performance and prepare you for your races. Coaching is about monitoring and progressing the athlete. We don’t give cookie cutter workouts and plans to our athletes. We individualize every athlete’s training and help you navigate through your journey with the needed training and guidance to race successfully while staying healthy and injury free and to finish feeling strong. Our athletes obtain better results because we use the most current and up-to-date information in exercise physiology, nutrition, health, and training. We continually stay current in the fields of run coaching, triathlon coaching, and health with continuing education and certifications. Get started in making the right investment in yourself. Whether you’re local or across the country, we guarantee to make YOU a priority. Find out how in the Rise Endurance Customer Guarantee.